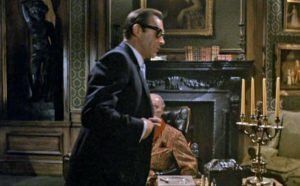 The cloth of Sean Connery’s blue suit in Q’s lab in Goldfinger is somewhat mysterious. It is a heavy weight, has a mottled colouring and has a woollen texture. That means it’s either tweed or flannel. Most likely it is a herringbone flannel. We get another look at the same Anthony Sinclair suit in Woman of Straw, and in this film—the suit’s original appearance—the suit is a three-piece. There’s no question it’s the same suit. The cut is the same button two with natural shoulders and a draped chest. It has swelled edges, cloth-covered buttons and jetted pockets. The vents are still a mystery. The poor lighting in this film makes the vent style difficult to make out, but I believe I see double vents. See the enhanced screenshot below. The trousers have double forward pleats. 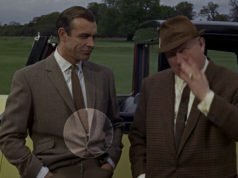 The waistcoat is the same style as the waistcoats in Goldfinger: six buttons with five to button. Connery, however, fastens the bottom button, which is meant to be left open. This disrupts the otherwise clean lines of the waistcoat. The covered buttons down the waistcoat make a big impact, since without the waistcoat the covered buttons almost go unnoticed. Covered buttons aren’t ordinarily seen outside of formalwear, but they were popular in the 1960s on lounge suits as well. The Avengers’ John Steed also wore suits with covered buttons. This is a town and country suit, meaning it can effectively transition between relaxed country wear and business. The cloth has a country texture in a city colour, and the jetted pockets are a more formal city touch. Even though this suit is appropriate in both the city and country, it fits in better here than it does in Q’s lab. The houndstooth suit that Bond wears in M’s office also seems more appropriate in this film. Connery wears this suit a few times throughout Women of Straw. Early in the film he wears a solid light blue tie, tied in a four-in-hand knot just like he does in Goldfinger. The white or off-white shirt has a moderate spread collar, a placket and double cuffs. 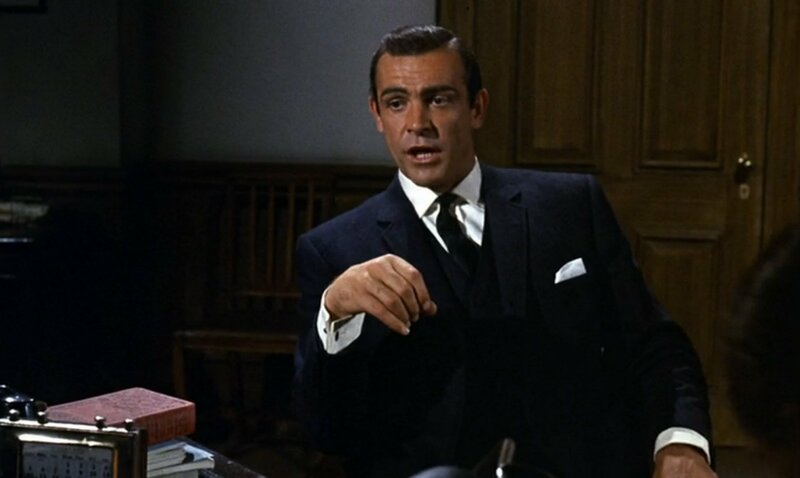 Later in the film he wears a solid black tie, also tied in a four-in-hand knot, and the white or off-white shirt has a wider spread collar like in Goldfinger. He wears a white pocket handkerchief with both outfits. A shame no one in costuming caught this gaffe here and with his other waistcoat. Looks to me more like a heavy flannel with a milled finished. Probably 12oz or so. That’s my gues. Now that I”m finally settled in my new city, I can once again contribute here. Great to be back. Great to have you back! I’m leaning towards tweed over flannel because of the stripes that suggest an uneven herringbone weave. So, quite a lot of clothing from this film was recycled in Goldfinger (or was it vice versa?) it would seem! This is a very nice suit although I don’t care for the pleated trousers and while the black tie seems to fit better with the outfit and Connery’s complexion overall, the light blue makes a pleasant change from his monochrome Bond look. In fact, this suit would look great with a blue striped shirt with white collar and cuffs of the type Moore wears in the FYEO pre-title sequence. Woman of Straw was made before Goldfinger, so Bond got the leftovers. It is a lovely looking suit and the cloth is beautiful even, if its exact nature is unclear. I’ve never seen a tweed cloth in this colour or looking quite like this but can see the slight suggestion herringbone. Whether light tweed or a flannel, however, I love the soft texture. I agree with the your guess about the vent. I looks like a double in the second picture. It seems to me that black and white can be worn within the monochrome theme, and it looks better to me. Here the light blue tie works very well, and the white shirt looks clean vs a dingy looking blue shirt. The darker vs lighter tie question becomes less troubling as long as it is noticeably lighter or darker. Trying to match colors gets close, but no cigar. My thoughts entirely, Steve. In Summer, I used to wear a dove-grey lightweight suit, and I made an effort to key shirt/tie/shoes to this shade. Then a kind soul pointed out that in certain light conditions I looked like a prowling ghost. From then on, dark ties and black shoes with that suit. And also, the light blue tie/dark navy suit combo was often sported by Cary Grant so it has a worthy pedigree. 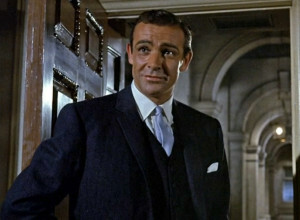 That said, Bond (& Anthony Richmond of WoS) got the blue tie/suit match-up just right. Another reason which leads me to believe it isn’t Tweed is why would you do cloth covered buttons on Tweed? It would look out of place. Search online and you’ll find examples of tweed suits with covered buttons. It’s not unheard of. Matt, you touch on the point above that this suit can make the transition from the country to the city due to its color. 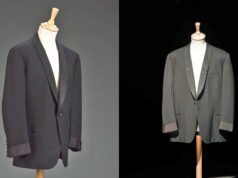 What other factors would allow a tweed suit to make this transition? Is it mostly down to color? Do the same general rules apply to sports coats? Also, I agree with David’s comment about the light blue tie. A beautiful suit and cut. Matt, did you feature the glen plaid that he also wore in this film? Another beauty, along with the white tuxedo. 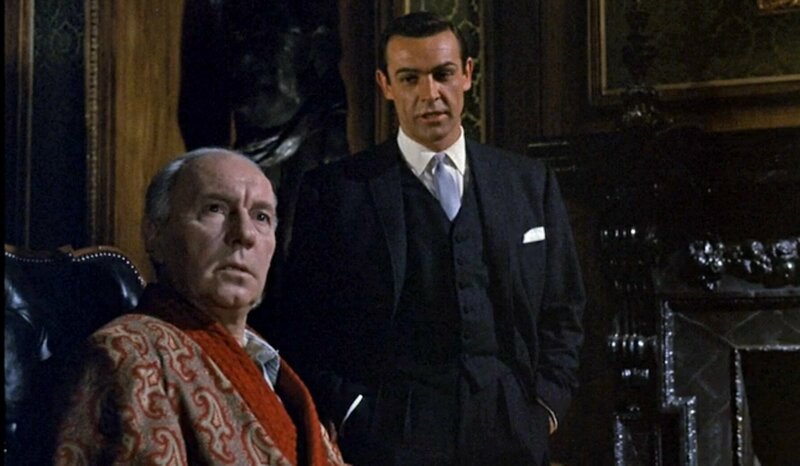 Since Goldfinger has such an iconic wardrobe with the glen plaid suit and white dinner jacket it surprises me that nobody noticed the clothes were first worn in this film. I must say that I had a very strong suspicion. His suits in Marnie though are different, I believe. Yes, the Marnie suits are definitely different from the Bond suits. But in his movies Connery had his own wardrobe? Connery did not wear his personal wardrobe for any movies. I’m guessing something was arranged so that Woman of Straw and Goldfinger could save money by sharing a wardrobe. 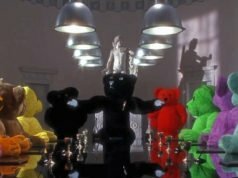 It could also be because Anthony Sinclair may not have been able to make enough suits for both movies in the short time required. Almost missed this one when it was in Goldfinger so it’s good to have a concise description, I like this style a lot, fortunatly it appears to be fasionable again, a typical Connery look. Covered buttons always look stylish but swelled edge lapels do nothing for me. Woman Of Straw was always one of my favorite 60’s glossy melodramas , so I’m glad to see all the marvellous suits under the microscope. Sean is always good when he plays bad! Geo.